For the spring semester, my colleague Dave Rogers and I are teaching a seminar class entitled “Human Phylogeography.” Phylogeography is the study of the history of the genetic variation, and of genetic lineages, within a species (or closely related group of species), and in the seminar we are looking at the phylogeography of human populations. DNA sequencing now allows a fine scale mapping of the distribution of genetic variation within and among populations, and, remarkably, the ability to sequence ancient DNA from fossil remains (including Neanderthals). The seminar is based primarily on a close reading of David Reich’s (2018) Who We Are and How We Got Here (published by OUP in the UK). A Krapina, Croatia, Neanderthal woman, photo by Jerry. Although rarely under that rubric, human phylogeography has been a frequent topic of discussion here at WEIT, by Jerry, Matthew, and myself, including our several discussions of Neanderthals (or Neandertals) and Denisovans. So it may be of interest for WEIT readers to follow along. Below the fold I’ve placed the course syllabus, which includes the readings, and links to many newspaper articles of interest, and online postings, including many here at WEIT, and also from John Hawks Weblog, a site we’ve recommended on a number of occasions when discussing human evolution. (The newspaper links appear as images; just click to go to the story.) We just finished our third meeting, and I’ve been quite impressed by the students’ discussion and writing. We’re fortunate to have some students from anthropology or with some anthro background. Please read along with us, or browse what seems interesting below. If you have questions or comments, post them here, and I’ll be looking in. Prerequisite. BIOS 260 or permission of instructor. Description. Phylogeography is the study of the history and causes of the geographic distribution of genes and lineages within a species or closely related group of species. Recent advances in DNA sequencing have led to a much finer scale understanding of the distribution of genetic variation within and among populations, and remarkably, the ability to sequence ancient DNA from fossil remains. In this one credit seminar class, the application of these advances to the study of human populations, including Pleistocene age Neanderthaloids, will be reviewed and discussed, primarily through a close reading of Reich’s (2018) Who We Are and How We Got Here. Readings. The primary text will be geneticist David Reich’s new book, Who We Are and How We Got Here: Ancient DNA and the New Science of the Human Past (Pantheon, New York, 2018). Additional readings will be assigned and posted to Canvas. Grading: The responsibilities of the students are to read the assigned materials before the class, to think about them before the class, and to discuss them in class. As you read, make notes for possible discussion concerning 1) things you did not understand; 2) things you found particularly interesting; 3) ideas you had about the material that were not expressed by the author. You must submit, via Canvas, your notes on each of these points the day before the class. We need to have them the day before, so that we may read them and be able to prepare items for discussion; bringing them to class will be insufficient for these purposes. Each student will also prepare a bibliography and brief overview of the knowledge of the origins of the people of a particular geographic area. The bibliography must include references to historical/archaeological/linguistic analyses, to blood group/protein polymorphism analyses, and to modern genetic/genomic analyses. The bibliography should use the author-date reference system (sometimes called the Harvard system) which is in general use in the population genetic literature. The overview should comment on each of the references, and be about two double-spaced pages with one inch margins and in 12 point Times New Roman font. The geographic area will be chosen in consultation with the instructors. Specific dates by which a student must choose their geographic area and submit their completed bibliography will be announced in class. Grades will be based upon class participation, as detailed in the first paragraph, and the bibliography submitted at the end of the semester. Pääbo, Svante. 20 November 2017. Ancient DNA and its Application to Human Evolution. Pääbo, Svante. 3 October 2018. A Neanderthal Perspective on Human Origins. Reich, David. 8 November 2018. Ancient DNA and the New Science of the Human Past. Avise, J.C. 2004. Molecular Markers, Natural History, and Evolution. 2nd ed. Sinauer Associates, Sunderland, Mass. Cavalli-Sforza, L.L. 1997. Genes, peoples, and languages. Proceedings of the National Academy of Sciences USA 94:7719-7724. Lewontin, Richard C. 1982. Human Diversity. Scientific American Library, New York. Mayr, E. 1970. Populations, Species, and Evolution. Harvard University Press, Cambridge, Mass. Pickrell, J.K and D. Reich. 2014. Toward a new history and geography of human genes informed by ancient DNA. Trends in Genetics 30:377-389. M.W. Feldman. 2002. Genetic structure of human populations. Science 298:2381-2385. Society of American Archaeology. 2019. Special section: Bones and chromosomes: The ancient DNA revolution in archaeology (Part1). SAA Archeological Record 19(1):15-42. This entry was written by whyevolutionistrue and posted on February 23, 2019 at 11:33 am and filed under human evolution, paleogenetics, phylogeny and systematics, science education, teaching evolution with tags Denisova, Homo sapiens, Neanderthal, phylogeography. Bookmark the permalink. Follow any comments here with the RSS feed for this post. Post a comment or leave a trackback: Trackback URL. Thanks for posting this with all the readings, etc. I cover some aspects of this topic in the next segment of my Honors Seminar this semester. Information on this topic has expanded dramatically in the last few years. I also have a number of freshmen this semester, so I have to strike a balance between the general concepts and the technical details. I read Reich’s book last year and enjoyed it a lot. However, several ancient DNA studies seem to be based on DNA of a single individual. In such cases one cannot infer anything about a population. There is the ‘principle of mediocrity’, which here can mean that the sample in hand is most likely to represent a common variety. The displacement of one population by another, and its timing, are common features in Reich’s book. Knowing, say, from ‘DNA of a single individual’, that a certain persisting DNA copying error change (can’t remember technical jargon for these mutations) occurred at least 9,000 years ago, rather than an earlier best bound of 7,000 years, would surely be a counterexample to the quote at the top, if one population had that mutation commonly, but the other didn’t. But perhaps my understanding of this exciting research is more than a bit simplistic. I’ve read through Reich twice now, and need to do so again. An even better counterexample would be what I suggested below, the discovery of a 4th human subspecies by somehow getting good DNA, very good luck once again, in the discovery of bones something like 50,000 years old. Single individuals cannot establish the frequency of a genetic variant, but they can establish the existence of a variant at a particular time and place. If there is an archaeological context, you may also be able to infer if the individual is in some sense “typical” of the population sampled. Thank you GCM for going to all this trouble. I’m starting with the videos & then the popular news articles. Seems interesting! I wish I could peruse the series of articles from the NYT, but it blocks me. Thanks for the links to articles and videos, this is an amazing resource! It will surely be an interesting and useful course! Here’s a question that might relate. With the mountains of individual human genomic sequence now out there and (I think) available, has anyone undertaken to look at, say, the sequences of A and B chain hemoglobins for neutral variations? IIRC there is/was a journal devoted to Hb variants that had been detected on some functional difference, and of course Sickle Cell Hb is the most well known example, but what about silent mutations, which includes ones silent enough not to be detected. Would the occurrence / abundance of some of those be useful in saying something about genetic drift? Many hemoglobin variants are known. A few, as you note, have functional significance, and confer heterozygote superiority in malarial environments, some have clinical significance, and others must be nearly neutral. I cannot quickly put my hands on an authoritative compilation. The data for hemoglobin variants are probably more extensive than for silent changes, since the latter can be detected only by DNA sequencing (not study of the protein). On Amazon a couple of reviewers are unimpressed by the legibility of the diagrams in the eBook [Kindle] edition. OUP said they’d “look into it” so maybe fixed by now. I’ve ordered the hardback just to be safe though I’m aware some of it will be hard going. Amusingly he got two one-star reviews from people without “verified purchase” next to their name. Both said that Reich is “agenda driven” & both have 5-starred Christian material in their review histories. A third person commented on the author’s surname – a Jewish implication I think. Some others commented on his left-leaning final chapters. Amazon should not permit reviews by non-purchasers. The Amazon review system has various problems, including plenty of instances of glowing reviews that are definitely paid for by the seller, and negative reviews by competing sellers. It is part of the ongoing battle of being listed high up in a search. Yes I know. It would be a doddle for Amazon to implement some basic automation improvements such as “verified purchaser” only & no reviews allowed in the pre-publication ordering period. Also books that keep selling after the marketing hype bubble has burst should be weighted to put them higher in the sales rankings. Some measure of product quality that can’t be faked. I’m not sure about Amazon book reviewers, but in many products I’ve looked at, fake reviews often are bunched around a date, not spread evenly as you’d expect from random reviewers. These can be discounted in making an evaluation. Often through Mechanical Turk & other such sites which host sellers who will pay you to post x quantity of reviews for dollars. And the bots are getting passably good at human language, so we are on our way to bots writing books that are reviewed by bots. I’ll get a bot to read them while I head to the beach. We’re all doomed. Perhaps we are doomed. I’ll get my SPF 30 and meet you. You bring ice, I’ll bring tea. I should have mentioned bringing a towel as well. Thanks for the quote. I read it imagining Richard Dawkin’s voice. Svante Pääbo is brilliant, we already knew that, though. Most of the links are New York Times, and I have but 2 articles left this month. Can anybody advise me on which ones to choose? Nicolaas, if you clear the NYT cookies from your computer, you will be able to get a new set of 5 free articles. I SO wish I could attend this class!!!! I wish it was streamed live so those of us who live hundreds of miles away could learn from this…like an online course. I’m serious. Highly recommend Reich’s book, although I recall some info was a bit difficult for this layperson. Also plan to go through the NYT articles; Carl Zimmer is a great explicator (is that a word?) of bioscience for us non-experts. For those who can’t get past the NYT paywall/article limit…well, for me, it’s worth the price to have access to real news and informed opinions. 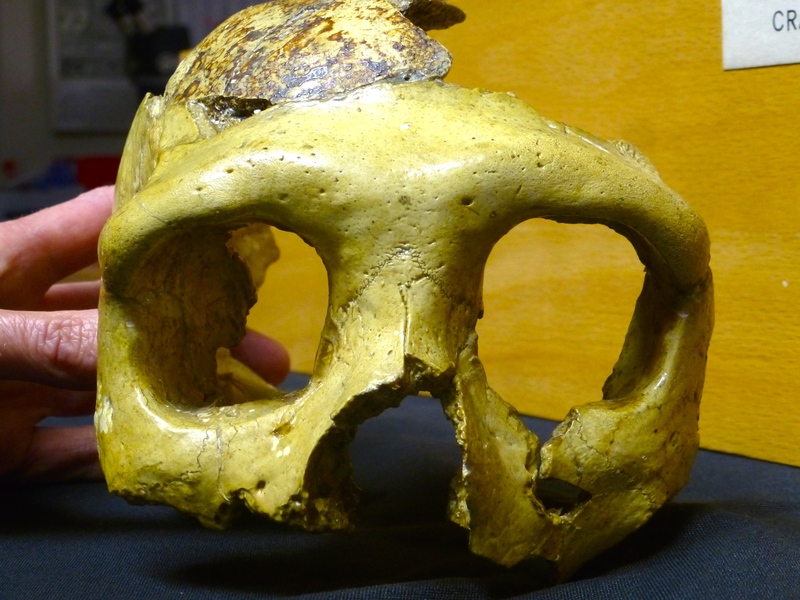 It is interesting you begin with the Krapina 3 cranium. This specimen has a nasal suture which deviates to the left instead of continuing straight up to the frontal bone. There is another set of nasal bones from the site, which has the same nasal deviation. This must mean that the two were related.So genetic links through morphology. There is no aDNA from the site, although the Leipzig people have tried. Krapina is a really interesting site, dated 130kyrs ago. We recently described 8 eagle talons from the site, probably strung as a necklace. The Krapina people were also right handed, like most of the Neandertals. Krapina cranium…sorry, my inner 12 year old can’t let that go! It sounds like a slightly more polite way to say I’ve got sh!t for brains. “Krapina cranium .. sh!t for brains”. Love it. And nice to see the ‘modern’ spelling of Neandertal. I do realize that something like $5/month is tough on some people, some students in particular. But, despite the negativities here on other aspects of NYTimes, those in academia: students, teachers, etc. can get an online subscription to them for little expense–might even be < $5/month?? What might be the ‘most exciting’ discovery in the short term along these lines? My vote might be if they discover some much more complete skeleton, esp. skull, in that cave, of a Denisovan, definitely known to be one because they got good DNA out of that ‘bone behind the ear'(again pardon my senile forgetting technical names). And then maybe the brain volume of the sample was in the highest 1% of anatomically modern humans! Denis, the Siberian hermit, is becoming much more famous than he bargained for. Or even if they discover a 3rd human subspecies, now extinct of course, but with genome sufficiently distinct to know it isn’t Denisovan, Neanderthal, or ‘modern’ Human. They did find a putative 4th in Asia again (other papers have seen it or something esle too, IIRC), see Pääbo et al recent paper based on the two whole genome Neanderthals. This sounds like a really interesting course! Excellent resource, thanks! Unfortunately I am uncertain how I can fold this into my schedule at the moment. So kind of you to post for those of us addicted to learning. I am looking forward to following along!